Table 30 in the original print and web versions of this report contained errors. All the data in the "Families receiving maximum benefit" row for Number and Percent have been replaced. Disability benefits were paid to over 9.8 million people. Awards to disabled workers (998,980) accounted for over 89 percent of awards to all disabled beneficiaries (1,114,060). In December, payments to disabled beneficiaries totaled about $10.4 billion. Benefits were terminated for 653,877 disabled workers. Average monthly benefit received was $1,110.50. Supplemental Security Income payments were another source of income for about 1 out of 8. Kia Masseaux managed the preparation of the data in this report. Art Kahn, Kia Masseaux, Clark Pickett, and Boris Shargorodsky wrote the programs to process the data and produce the statistical tables. Kevin Kulzer wrote data specifications. Kevin Kulzer, Hazel Jenkins, and Kia Masseaux validated the data. Staff of the Division of Information Resources edited the report and prepared the print and web versions for publication. Your suggestions and comments on this report are welcome and should be directed to Kia Masseaux at 410-965-0090 or statistics@ssa.gov. Contact information is also provided on each table. For additional copies of the report, please e-mail op.publications@ssa.gov. 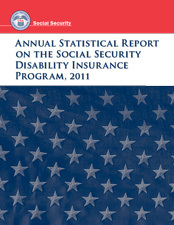 This and other publications on the Social Security and Supplemental Security Income programs are available on our website at http://www.socialsecurity.gov/policy.